This weekend marks the 40th anniversary of chef and sustainable food expert Alice Waters' Chez Panisse Restaurant & Cafe in Berkeley, CA. To celebrate the occasion, many institutions in the Berkeley community are hosting special foodie events as well. 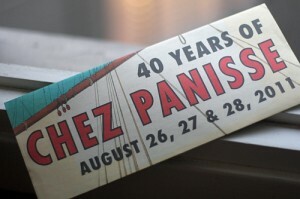 "Join us as we celebrate 40 years with food, art, music, and dancing in the streets," reads the Chez Panisse official website. The 40th anniversary Chez Nous dinner is a benefit for Waters' non-profit Edible Schoolyard Project at $2,500 per plate. Tonight's Provencal-themed meal is an homage to Nicolas Pagnol, grandson of The Baker's Wife filmmaker Marcel Pagnol. Reservations are currently sold out for this event, yet Chez Panisse encourages patrons to host their own dinner parties to bring in donations for Edible Schoolyard as a part of their Eating for Education movement. Tomorrow, the Berkeley Art Museum will host two afternoon screenings of Pagnol's The Baker's Wife with special introductions by Alice Waters, Nicolas Pagnol, and Pacific Film Archive director Tom Luddy. The film was highly influential in the start-up of Chez Panisse and also inspired the name of the restaurant. Additionally, the UC Berkeley Art Museum plans to partner with OPENrestaurant to create an ongoing interactive exhibit called OPENeducation. The project traces the roots of food from farm to table, and "invites participants to collaborate with students, educators, farmers, cooks, and artists in constructing the elements of a lunch menu in a series of independent classrooms." Several other events are happening this weekend as well. The full schedule of events can be viewed at www.chezpanissefoundation.org.